I’m not sure if it’s apocryphal or not, but Harold Macmillan supposedly once claimed that what politicians in government fear most is “events, dear boy, events”. For the academic, the publication of a long-gestated project can hold similar trepidation. The ‘thing’ that you set out to study can, in the rear view mirror, seem distant and irrelevant; overtaken by the ‘next big thing’. Security in a Small Nation does not suffer from such problems. On the day that I sat to write this blog a debate in the Scottish Parliament on a second independence referendum was cut short due to a terrorist attack on the Westminster Parliament and the surrounding area. 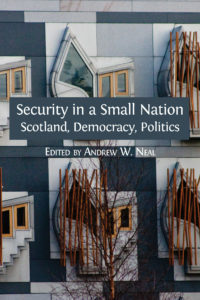 That Security in a Small Nation, published only days earlier, is sub-titled Scotland, Democracy, Politics, seemed eerily and entirely relevant in this context. My involvement with what would become Security in a Small Nation began in 2013 as a postgraduate affiliated with an ESRC project led by Dr Andrew Neal of the University of Edinburgh, under the title ‘Security in Scotland, with or without constitutional change’. The project involved six one-day seminars that brought together policymakers, politicians, practitioners and academics to explore the implications of constitutional change for security governance in Scotland and the rest of the UK. The project title was clearly hedging its bets, and rightly so. Not many predicted – and certainly I did not foresee – the constitutional complexities that would coalesce in the period following the 2014 independence referendum result. The triumph of the seminar series, and the subsequent book, is that the central themes explored – the meanings of security, international comparisons and alliances, regional cooperation, terrorism, intelligence sharing, democratic oversight, accountability, and media coverage – remain entirely relevant, despite the vast changes in circumstances from the halcyon days of 2013. In hindsight I learned a lot from my participation in the series of seminars that informed the book, and many of the fine contributions I heard have made their way into the pages of Security in a Small Nation. For me, it was invigorating to hear at the time from Hugh Bochel and Andrew Defty, and their chapter on the lessons that can be learned from Westminster about parliamentary oversight of intelligence agencies is masterful. Similarly, one need not be an expert on the shenanigans of the current @POTUS Donald Trump, or the rise of #fakenews to the forefront of public consciousness, to appreciate Eamonn O’Neill’s work here on press scrutiny of intelligence agencies. Given the overall breadth and depth of contributions – from early-career (Nick Brooke, Brian Harris and myself) to the pre-eminent (look no further than Thierry Balzacq, amongst others) – I am confident that Security in a Small Nation says something of value to a range of readers. Certainly, the overall project has attuned a new group to the possibilities and promise of diverting the academic gaze on security matters to – in the Scottish patois – the ‘lesser well-kent’. Security in a Small Nation addresses the requirement to engage with security issues in the context of constitutional upheaval. The pressures that muted the discussion of security in Scotland’s 2014 independence referendum may very well continue if, as seems likely, the Scottish Government succeeds in securing the necessary political support to notify Westminster of its intention to ‘go again’ (although whether Westminster considers such a prospect palatable in the timescales favoured by the Scottish Government remains debatable). Security in a Small Nation, and the seminar series that has preceded it, engages with the pertinent issues and brings together a group of like-minded researchers and practitioners. I hope that if the next referendum on Scottish independence occurs and security continues to be treated with, in Sandy Hardie’s words ‘hardly a moment’s discussion’, then this fleeting moment will be informed by a more robust, rigorous and dynamic range of evidence and analysis than was afforded in 2013/14. Only time will tell how such ‘events, dear boy, events’ transpire. Security in a Small Nation can be read and downloaded for free here. Dr. Colin Atkinson is an early-career lecturer in criminology and criminal justice at the University of the West of Scotland, UK.